On 13 March, State Solutions LLP attended the Parliamentary Lunch in the House of Lords with Baroness Smith of Gilmorehill, John Cridland CBE, Director-General of the Confederation of British Industry, and Trevor Barton, Executive Director of the Russo-British Chamber of Commerce. This event saw a select group of RBCC Members and Partners gather in the splendid surroundings of the Houses of Parliament, overlooking the River Thames. Alex Andreev and Margarita Agapidou of State Solutions LLP attended this top-level networking event, discussing the latest developments in Russian-British business with guests representing companies operating in London and Moscow, including PwC, VTB Capital, Baker & McKenzie, Savills, Good Governance Group et al. 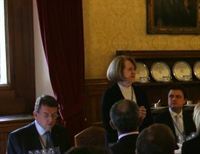 The Lunch host Baroness Smith of Gilmorehill warmly welcomed the audience in the Houses of Parliament, outlining the successful state of the Russian-British trade and commerce in the context of the bilateral relations between the two countries. John Cridland CBE, the key spokesman for the UK business community in the media and with the government, representing the CBI, the voice of business in Britain and internationally, delivered an insightful speech to the audeince. John's frank and informative contribution focused on the improving state of the British economy and outlined the great potential for further development of business ties between Russia and the UK. In his conversations with Baroness Smith of Gilmorehill and John Cridland, Alex Andreev spoke about the government relations and lobbying industry in Russia, its meaning for businesses, developments in the dialogue between foreign businesses and the government, as well as about bilateral economic and business relations. The Parliamentary Lunch was a great opportunity to exchange views, share experiences and perhaps think of new opportunities about doing business internationally.